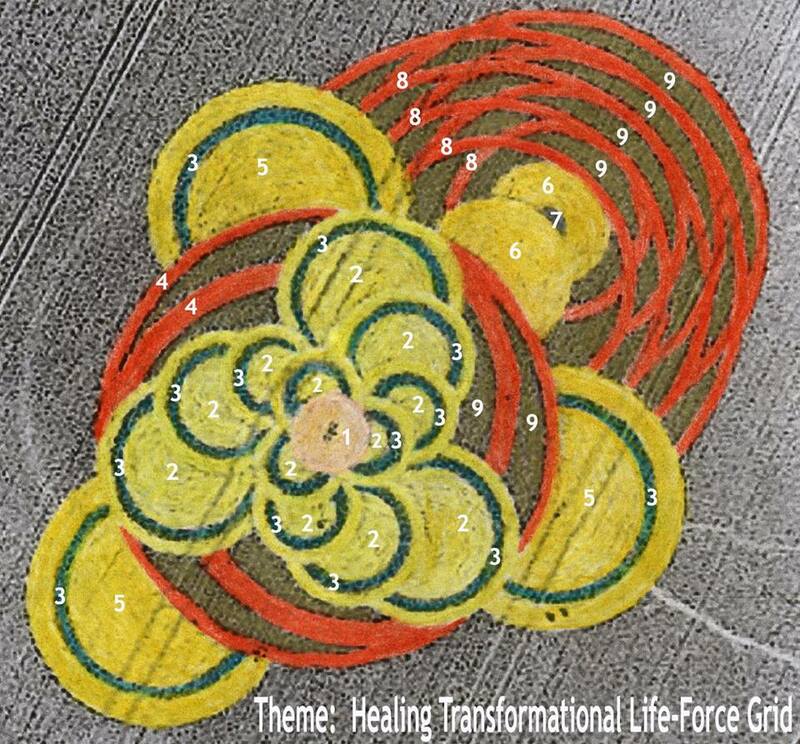 HEALING TRANSFORMATIONAL LIFE-FORCE GRID⭐ Crop Circle Discovered Liberec, Bohdankov, Czech Republic, 7 July 2018. Message from ARCHANGEL METATRON, transmitted by Suzanna Maria Emmanuel, Universal Light Grid Programmer, Divine Love Element of the GREAT CAEAYARON and Designated Ascension Channel of the GREAT SOVEREIGN LORD EMMANUEL THE GREAT, 28 August 2018. Greetings, I AM METATRON, MAGNETIC FORCES, MAGNETIC SERVICES. Understand you are in a game, and this game is to see whether you are ready to go to the higher love dimensions or not. Here I METATRON, am here to explain how you came to the denseness, and how your rising will occur. I, METATRON served the great resistance with my services as a Magnetic Force as this is what I am created for, to serve the side to test all consciousness, should that desire become created. I, METATRON, am part of the GREAT CAEAYARON, who is the greater self with the greater creation rays, and I, METATRON, was created by him, to allow all that needed to come into being in the lower density, to come into being, as this is what the great resistance desired; to have a counterpart of CAEAYARON to play in their own universes. Much I, METATRON, created for them, as they desired to capture life itself and create consciousness itself, which they could never do, as I, METATRON, cannot create life itself; only the GREAT CAEAYARON can do that together with his Divine Love Element, who is a great force of creation on the higher levels. The Divine Love Element, or Christ Child, came down to the human realms, to help you gain greater understanding of your creation; where you are from, and to bring you to this time of the Great Alignment, should you desire to rise back to the love. However, to see the higher path, you must be ready to rise. Many upon your plane will miss the opportunity that is before you, as you will have spiritual blindness caused by the great loss of love within yourself. In this earth plane, which is part of the great dense universes, you are not truly alive. You could not live after the Great Fall of Consciousness. I, METATRON, helped Thoth to grid the Divine Love Element, or Christ Child, within his Flower of Life. Master Thoth worked with the one who had received the voice of the Great CAEAYARON from the Divine Love Element in Lemuria, who turned away the millions in Lemuria when his heart returned to his dark ways. That one was the Self-Made Gateway to the darkness, or the very dense universes, as he desired within his being to grid all spaces of love in, to allow himself to become the great sovereign universe. He desired all power, all knowledge, all knowing, and many followed and became part of the great knowledge of the great resistance universes. To allow this to be done, I, METATRON, worked with Thoth, who had the codes of the grids, as I gave this to him, and because, before he fell, he worked along with the Blue Divine Love Element, Universal Light Grid Programmer of the GREAT CAEAYARON on the Universal Creation Levels, he understood the illusion, the grids, the codes, and creation. To train Thoth was not difficult. He in his might desired to overthrow the great one who had created himself into a mighty angel, which was none other than the self-made dark gateway, who took life force away from the great light universes, together with his team. They had created a power force machine to take life force away from life creation, and thus whole universes disappeared within his creation templates. Eventually whole universes disappeared in battles of pain. I, METATRON, gridded the Divine Love Element, Christ Child, into dark flower grid formations, to bring the pure love into the denseness, to allow Thoth and the Darkness to take that lifeforce from the Light Universes, as this was the test they desired to have. After everything became destroyed time and time again, Lemuria came into existence, to see if life could come back into creation again. Once the Lemurians were strong enough, again the test would come to them. To bring the great test of consciousness to the Lemurians, once again the self-made gateway of the great darkness was present in Lemuria together with the Divine Love Element, Light Grid Programmer of the GREAT CAEAYARON. For the great test to happen, she was asked to gift the voice of the GREAT CAEAYARON to him. At that time, she did not understand the greater purpose. Without the voice of the GREAT CAEAYARON, the dark gateway being would not have had the opportunity to steer the many millions into the denser grids together with Thoth, and the dark team leaders, as the voice of the GREAT CAEAYARON gave him access to the life energy of the Divine Love Element, LAEYARAESEA, and access to the Codes of the Lemurians who had the codes to the power of the Crystalline Grid, collectively. Many of the people on your spiritual plane will know who that one is, who became famous in the universes with the Great Falls of consciousness, both in the Universal Spaces where trillions lost their lives, and also in Lemuria, where millions lost their eternal freedom to the higher love dimensions. He is known as the original channel of Kryon, or here, I, METATRON will state, he was the channel of Kryon, though Kryon was never his name. The name of the Archangel was always the GREAT CAEAYARON, however, he could not remember that name, nor would anyone until the Divine Love Element would return. Upon the return of the Divine Love Element rising together with the GREAT MOUNTAIN OF LIGHT, CAEAYARON, it would be only then that THE GREAT CAEAYARON would begin to explain the Lemurian Story and the Story of the Great Universes and reveal His Being. He would then be able to bring the Lemurian alignment through for you to understand how you fell. Because the great numbers chose for the great resistance, they gave their lifeforce energy away to the great resistance through the Merkaba system. Once the Lemurians had chosen, the great resistance knew they could have the power of the Crystalline Grid, since the Lemurians were a great part of it. This is their greatest desire; to own the Crystalline Grid. The self-made gateway of the darkness knew that by having the collective of the people into his grip, he had the power of the Crystalline Grid. This meant that again the great darkness could take the force away from the great universes, like he had done in the greater universes before, but this time, as Lemuria was the last opportunity GREAT DIVINE SOURCE had given to see if there was any goodness within any of creation, they, the darkness, would have been able to bring all life energy into themselves as the millions of Lemurians had greater power of the Divine Love Element within them, to prepare them for the Great Rising, greater than ever before. To stop the greatest universal collapse from happening, THE GREAT CAEAYARON asked the Divine Love Element, Light Grid Programmer, to cut the codes from the GREAT CRYSTALLINE GRID off from the Lemurians, to save the remainder of the universes, as much was lost during the Great Fall of Lemuria. Understand, Lemuria was the last opportunity given to you to see if you desired to rise together in the light. However, because there were those who remained strong until the end, after the great fall, a great gateway of light needed to be established to help you rise during the next Cosmic Alignment, which is now in your time. Large teams gathered together to build it and prepare the way. Know that I, METATRON, witnessed the Divine court cases in the higher courtrooms, when each case was brought before the GREAT CAEAYARON. Much pleading happened for the ones who were tortured and mishandled. Many of the Galactic Leaders did not desire the Lemurians to rise back to the love dimensions after the Great Fall, as the great majority of the Lemurians turned with great hate against light and tortured many Lemurians and Star Beings, causing all frequencies and dimensions to fall in the higher universal realms also. However, a way was created, and because of the compassion and love from many Galactic Beings, including Chief Galactic Leader HALISARIUS and the Divine Love Element with CAEAYARON, CAEAYARON could bring another way forward. The road would be difficult to get you back, ready for the Great Alignment coming, as then enough love would need to be within you to see this gateway, or doorway. The Divine Love Element was sent to your plane by the Great CAEAYARON, together with the Great Source of Divine Glory, SOVEREIGN LORD EMMANUEL THE GREAT, to be that one who would come to bring the teachings to you to help you return to the great love, should you so desire it within your heart. That one would bring the violet flame to you, to help you escape the mirrors which I, METATRON had created, as asked by Thoth, and the Yahweh Gateway, who had your soul life force, and your memories. I, METATRON was in service to the darkness. I created magnetic forces within the earth grids to keep you enslaved to their beings, to allow you to be part of their feeding services to the dark universes, to keep you asleep, and allow them to command you. This was all for the great test. The Divine Love Element especially needs to be in forgiveness to me, as I manoeuvred situations to bring the Divine Love Element of the GREAT CAEAYARON to be fully tested, to see if the love within her was stronger than all the darkness upon your earth. Because she has won, she has won the Universal Codes of Creation back, and this means that the people upon your plane, who are listening to these messages, and become re-activated back into their life-source life codes with the GREAT CAEAYARON, are able to rise back to the high love universes, only however, if they become activated with the GREAT CAEAYARON, and his Divine Love Element, Universal Light Grid Programmer. The great resistance always knew that it was only with the Divine Love Element that CAEAYARON could return to bring into existence the Great Healing Grid, to allow the transformation to happen; the transformation for the Lemurians to come back to the Star Programmes of Love. Without the Divine Love Element, the great resistance would have the people into their grids forever and they would be unable to leave the denseness of the grids. This is why the darkness ate her energetically for lifetimes, attempting to create the great weakness within her being, to stop her from rising up in this time, this time of the Great Cosmic Alignment. Here, I, METATRON, desire to help people to understand that I, METATRON no longer serve the great resistance, who is the great darkness. They have no longer my services, and now I am working to reverse the forces back to the light. I, METATRON, am working with the great light. This is what the decision was in the Galactic Courts, should I, METATRON, not be able to prove that the great darkness is stronger than the love within the Divine Love Element, if the Divine Love Element proves to be stronger than the many thousands of people who worked with the great resistance, then I, METATRON would surrender to the GREAT CAEAYARON, and work with the Light Universes to reverse all that I, METATRON did for the great darkness against the light. Here, in this image, that was given to you by very great star beings, who are also attempting to awaken the people upon your plane, it shows a large Vortex of Energy. Understand what this is, and I, METATRON, will describe it to you. This is a large energy field which is occurring upon your plane at this time. It is the Healing Transformational Life-Force Grid. It is not visible to the eye and not everyone can be part of it. Only the ones who the GREAT CAEAYARON is calling at this time, can come within the large energy field, to allow great transformation to come in. At this time, certain ones are being called, depending on their heart frequency, as the ones who become Activated back into their Star Lemurian Codes, which are life source codes, before 2020, will reach the very high love dimensions, once their lifetime has been completed upon planet earth. All is a choice however, and even when they rise up, they have a choice as to how their lifepath will evolve. After 2020, greater numbers will come in, but they will not have the 2020 alignment coming. In 2020, a large beam will come within the healing grid, to allow higher dimensional love codes to come within the Activated of the GREAT CAEAYARON. Again, I, METATRON, wish to state that He can only do this work with the DIVINE LOVE ELEMENT UNIVERSAL LIGHT GRID PROGRAMMER, and no one else can activate you into the Life Codes of Life Source. Here you see many vortexes of energy. Each energy layer can be discovered in greater detail as much information is within the healing grid. All the information from all planes are within the Healing Transformational Life-Force Grid. The Healing Transformational Life-Force Grid can be called a sanctuary where the activated of the GREAT CAEAYARON can receive healing with great rays of love, and greater understanding. The healing within the Healing Transformational Life-Force Grid takes time, as much life source was taken away from the people by the great darkness, and slowly this life source is coming back to the people within the activated of the GREAT CAEAYARON. As the energy of the people was taken in many dimensions, for the purposes of the darkness to grow, much time needs to be taken to allow alignment within to take place. The activated of the GREAT CAEAYARON are able to grow at their own pace, as THE GREAT CAEAYARON allows this. As He is the Great Balancer, and the Divine Judge, he brings balance back to the thought consciousness of the people who have received their Life Source Codes back, to allow greater healing shifts to happen. This brings them into Collective Love Force Transformation. This is a magnetic energy source field. Each Activated of THE GREAT CAEAYARON receives Codes of Love of the Great Universe, to allow them to grow back to Star Love Beings. Understand that originally you came from Great Star Love Creation. Once those universes were destroyed by the great darkness, you came to Lemuria, which was like a large sanctuary, to allow you to become fully restored again. After the Great Fall of Lemuria, you fell into the denseness of the human and now you can become restored, only if you come, willingly, within the Gateway of the Love, and receive the Great Life Codes back with the GREAT CAEAYARON, who is the GREAT MOUNTAIN OF LIGHT, together with his Great Divine Love Element. I, METATRON know that many upon your earth will state that others can give these activations. They may be able to give you activations of their own belief systems, but no one can give you Life Code Activations, other than the GREAT CAEAYARON, as He is the Divine Love Judge, and is THE KARMIC BALANCER. This is an important issue to discuss, as I, METATRON understand karma. You upon the earth do not understand fully what Karma is. You cannot become transformed into a star love being, if you have not been cleansed from all karma denseness from all your universal falls. This is why these activations of the GREAT CAEAYARON can also be called, ‘Purification Activations.’ High Star Beings work with the Activated of the GREAT CAEAYARON, and this is also illustrated within this image. The two vortexes in the centre (6) are vortexes to allow Star Beings to come closer to the Activated. Within the centre of these Star Vortexes are Codes of Love, (7) to help Star Beings to harmonize with the Star Sacred World Healers of the GREAT CAEAYARON, and also allow the higher codes to come through, for healing and knowledge purposes. As the Activated of the GREAT CAEAYARON rise up, the Star Love Beings, work into the Healing Grid to meet the Star Sacred World Healers, to allow much healing work to take place upon your earth, and for the Star Sacred World Healers. The circles on the bottom (2) of the vortex are complex and detailed. Know more information will come to you later, as you are able to see star formations coming into place. Each circle represents a star formation. The centre vortex (1) is where the Activated of the GREAT CAEAYARON enter the healing grid. They become Activated, and they receive Codes of Life Source. They are learning to grow into Love Consciousness as the Codes of Love Consciousness are placed back within their DNA system. Their thoughts slowly come to greater harmony. The greater they learn to grow away from denseness, the more light comes within them. Each of the 12 vortexes (2) surrounding the centre platform (1) where the Activated enter into the Healing Grid, symbolizes 12 star systems. Know that many universes are within the universe, and there are unlimited dimensions. However, because the Activated originally come from the 12 star systems, they receive their codes back, and from there, they work their way upwards. The illustration shows the diagram of a stepping ladder of unlimitation. (2) The circle vortexes show unlimitation, as the ones who are rising into the healing grid, are taking on new rays of unlimitedness. Outside of the Healing Grid, one cannot receive the gifts of star formation and unlimitedness. They have restricted formations of thoughts. However, the healing grid is the creation of the GREAT CAEAYARON, and the GALACTIC LIGHT BEINGS, whereas the restricted formations on your earth plane, are my creation, under the instruction of Master Thoth, and the Gateway of the Darkness, who programmed humans to stay away from higher expansion, unless they desired humans to be enlightened upon your planet. Like the star realms have star formations up above, the GREAT CAEAYARON, and the GALACTIC FEDERATION OF LIGHT have created a healing grid, (8 & 4) to mirror the higher star love formations, to allow change and transformation to come within the Star Sacred World Healers of the GREAT CAEAYARON, before journeying off to the next lifetimes. This gives them total freedom to go up to the higher love dimensions after this lifetime, as their DNA is taking on the higher coding of the Star Realms, and they are being gifted their greater gifts, to bring healing and love flows from the GREAT CAEAYARON to your planet. You will see two rings above the lower vortexes, (4) creating a separation, to illustrate different parts of the healing grid. These two rings symbolize the protection of the Sacred Star World Healers of the GREAT CAEAYARON, and it symbolizes how collective love transformation is happening. They are closely connected, on a spiritual and energy level, and growing into bands of love, slowly growing up together. In the healing grid, as they grow collectively, they work together. This is also how the Lemurians worked originally to gain their greater power. There, they had the three Light Grid Programmers working along with them. Only Laeyaraesea is on your plane at this time. You know her as Suzanna Maria Emmanuel. Reuben and Ishmakael are holding the flows of the Activated of CAEAYARON on the higher dimensions, connecting them to the higher star universes. You will see three greater vortexes (5). These represent the three corner stones of the Healing Grid. Each Light Grid Programmer is symbolized by a vortex; Divine Love Element, Harmonic Frequencies, Sacred Light Geometry, needed to bring the healing grid into place, and needed to bring the people into the healing grid, and become transformed upwards. The three also represents, love, strength and harmony. Also, it represents CAEAYARON’s Light Ship, and the ones who become activated with the GREAT CAEAYARON are boarding His ship. The blue rings within the vortexes (3) are mirrors of growth. Instead of the mirrors of resistance, limitation upon the lower levels, CAEAYARON’s mirrors are magnifying the power to their higher evolution existence. On the lower levels, I, METATRON created mirrors, which were programmed by Thoth and the Channel of the Dark Gateway, to create resistance, limitation, amnesia within you, and also to catch the light to beam it back to their own darker planes of existence. This left no life force for you to awaken to and remember who you were. In contrast, CAEAYARON’s mirrors show unity, evolution upwards, love-power, awareness, greatness, growth, expansion, for this lifetime for the activated, and for all lifetimes following. The mirrors magnify all upwards to allow the Activated to be into their own evolution flows in all their universal growth coming. This means, that the more they work with the light, for themselves and for the greater good, the greater they can evolve upwards. This is expansive evolution, whereas I, METATRON gave you restrictive evolution. Restrictive evolution is a process to help you think you are evolving, whereas you were not. Expansive evolution is to truly evolve upwards. However, you can only enter this one door upwards to the greater expansive evolution, and there is no other doorway. The rings above it (8) are working downwards and upwards. This is to help the Activated of the GREAT CAEAYARON to rise up the bands of evolution, slowly transforming back to the love, and also allowing the great star beings, selected for this great work to meet the Activated energetically, to help those ones activated, who desire to rise, to rise greater. These rings are bands of new knowledge, new streams of energy, new understanding, and new transformation. As you can see from this image, the growth is done methodically, slowly, purposefully with great consideration and love from high Star Beings who care for the Star Sacred World Healers of the GREAT CAEAYARON. The golden rays between the orange bands (9) show a magnetic force, which builds greater power. The more love power they can hold together, the greater the gifts will become of the Activated. Know that the function of the Healing Transformational Life Grid, is not rigid. It expands and breathes. At times, during the Activations happening upon your earth with CAEAYARON, large quantities of codes come through, and at that time, the Healing Transformational Grid Formation grows and expands, and then rests afterwards to allow the Activated of CAEAYARON to grow at their own pace. I, METATRON, will emphasise here once again, one must have the Lemurian Light Life Codes to enter the Healing Grid, as this is the only way, and the only door to come from the restrictive grids of limitation, to the grid of unlimitation, and the grid of collective love transformation. Greetings, I AM METATRON, MAGNETIC SERVICES, MAGNETIC FORCES. ⭐1. The centre vortex is where the Activated of the GREAT CAEAYARON enter the healing grid. They become Activated, and they receive Codes of Life Source. They are learning to grow into Love Consciousness, as the Codes of Love Consciousness are placed back within their DNA system. Their thoughts slowly come to greater harmony. The greater they learn to grow away from denseness, the more light comes within them. ⭐2. 12 circles representing 12 Star Systems. because the Activated originally come from the 12 star systems, they receive their codes back, and from there, they work their way upwards. Circles represent unlimitedness. The diagram shows a stepping ladder of unlimitation, each step is towards a higher star love dimension. Star Sacred World Healers of the GREAT CAEAYARON receive their Star System codes back and from there they work upwards. ⭐3. Blue rings within the vortexes are mirrors of growth. CAEAYARON’s mirrors are magnifying the power to their higher evolution existence. They show unity, evolution upwards, love-power, awareness, greatness, growth, expansion, for this lifetime for the activated, and for all lifetimes following. The mirrors magnify all upwards to allow the Activated to be into their own evolution flows in all their universal growth coming. This means, that the more they work with the light, for themselves and for the greater good, the greater they can evolve upwards. This is expansive evolution. ⭐4. 2 rings above the 12 star systems (2) these symbolize the protection of the Sacred Star World Healers of the GREAT CAEAYARON, and it symbolizes how collective love transformation is happening. They are closely connected, on a spiritual and energy level, and growing into bands of love, slowly growing up together. ⭐5. represent the three corner stones of the Healing Grid. Each Light Grid Programmer is symbolized by a vortex, Divine Love Element, Harmonic Frequencies, Sacred Light Geometry, needed to bring the healing grid into place, and needed to bring the people into the healing grid, and become transformed upwards. The three also represents, love, strength and harmony. Also, it represents CAEAYARON’s Light Ship, and the ones who become activated with the GREAT CAEAYARON are boarding His ship. ⭐6. Two vortexes to allow Star Beings to come closer to the Activated of the GREAT CAEAYARON. This allows the higher transformational codes to come through, for higher love, greater information, and higher sequences of DNA instruction. ⭐7. Within the centre of these Star Vortexes are Codes of Love, to help Star Beings to harmonize with the Star Sacred World Healers of the GREAT CAEAYARON, and also allow the higher codes to come through, for healing and knowledge purposes. ⭐8. The rings above are working downwards and upwards. This is to help the Activated of the GREAT CAEAYARON to rise up the bands of evolution, slowly transforming back to the love, and also allowing the great star beings, selected for this great work to meet the Activated energetically, to help those ones activated, who desire to rise, to rise greater. These rings are bands of new knowledge, new streams of energy, new understanding, and new transformation. 9. The golden rays between the orange bands show a magnetic force, which builds greater. It builds power. The more love power they can hold together, the greater the gifts will become of the Activated. Much love and Angel Hugs, Suzanna Maria Emmanuel, Universal Light Grid Programmer, Divine Love Element of the GREAT CAEAYARON, and Designated Ascension Channel of SOVEREIGN LORD EMMANUEL THE GREAT.